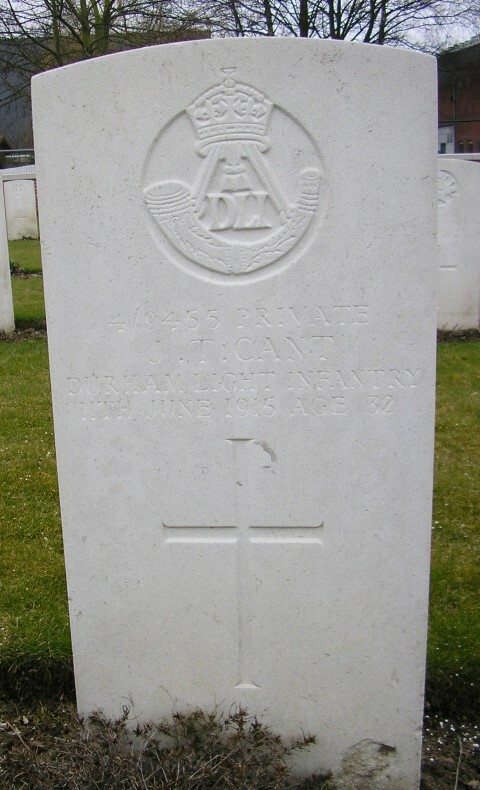 4/9455 Private John Thomas Cant, 2nd Battalion, the Durham Light Infantry was killed in action 11 June, 1915 and is buried at Potijze Burial Ground Cemetery, Belgium. 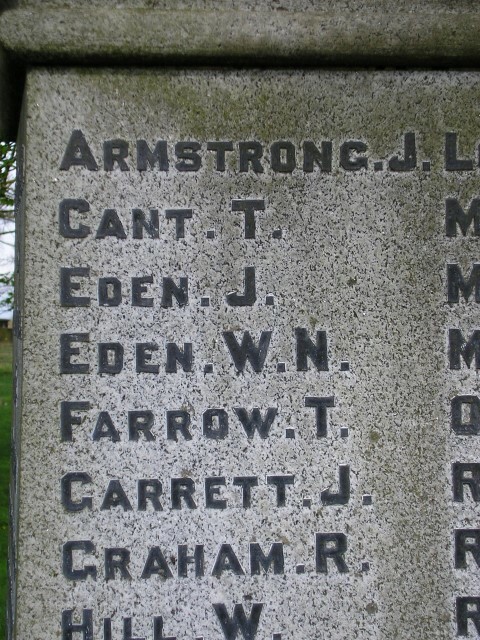 He was 32 years old and is commemorated on the Kirk Merrington War Memorial. In 1891 the family lived at Darlington Road, West Auckland where John worked as a coal miner. 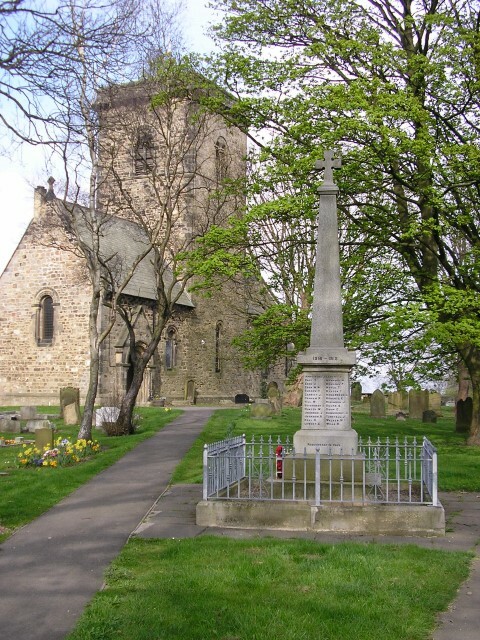 By 1901, they lived at the 16 Oaks, Evenwood and 42 year old John worked as a coal miner (hewer), 18 year old Thomas was a coal miner (putter) and 14 year old William was a coal miner (pony driver). 24 February 1902: aged 19, Thomas enlisted into the Durham Light Infantry [regimental number 7782]. At that time, he was single, 5’8” tall and weighed 9st. 4lbs. His faith was Roman Catholic. He worked as a miner. 10 September 1914: The 6th Division landed at St. Nazaire and proceeded to the Western Front where it remained throughout the war. It arrived in time to reinforce the BEF on the Aisne before the whole army was moved north to Flanders. 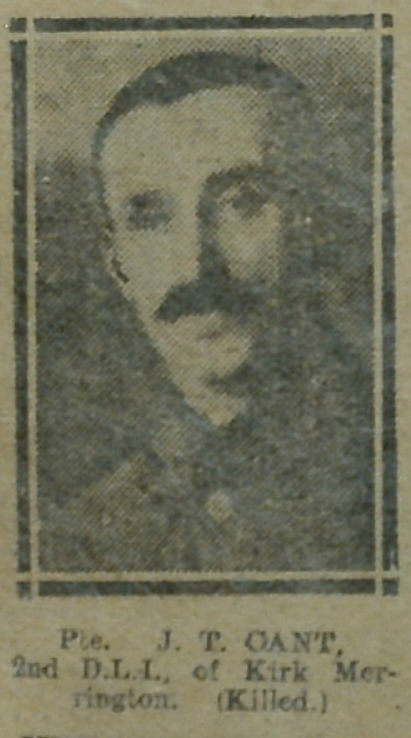 4 January 1915: Private Thomas Cant entered France. He was probably in the line on the night of the 31 May/1 June 1915 when the Division took over its new front in the Ypres Salient. The Division stayed in this sector until the end of July 1916. Even though no active operations took place, trench casualties doubled immediately. Battle casualties during the whole period amounted to 10,938. At this time the 6th Division formed part of the 5th Corps of the Second Army and the First and Second Armies were bearing the brunt of the fighting along the British front but the coming of June 1915 brought a comparative lull along the southern British front until the middle of the month. However a new German weapon – incendiary rifle ammunition was introduced. The 2/DLI was involved in operations at Hooge 2 June, 19 July, 30th July and 9th August. This section extended on our right fro a point 200 yds. North of the VERLORENHOEK ROAD to a point 250 yds. South of WIELTJE on our left. Extent of front 700yds: two coys in fire trench and two in support. Held by CAPT. CODDINGTON’S Coy: CAPT. TURNER’S Coy and Lt. BEANS, CAPT. BOWERS Coy respectively.